In Myanmar, as elsewhere around the globe, the “war on terror” is used to justify persecution. On November 21, 2015, five individuals were arrested in Myanmar for publishing materials “that could damage national security.” Their offense? Printing calendars. It sounds surreal but such is the reality in the age of the “War on Terror.” Daily and mundane activities can and have been prosecuted by states under the rubric of “protecting national security,” targeting not only dissidents but regular civilians going about their daily lives. Kyaw Kyaw’s printing company was asked to make the calendar, which referred to the Rohingya as an ethnic group, by Aung Khin from Sittwe, the capital of Rakhine state. Police allege that after hearing about the arrests of the five in Yangon whom he contracted to make the calendar, Aung Khin was also a suspect, and remained “at large.” Considering the fact that being in police custody in Myanmar might mean the end of your life, torture, and other forms of abuse, it is understandable why Aung Khin would be hesitant to turn himself into authorities, especially for an “offense” as absurd as printing calendars. The Kafkaesque dance that Burmese military authorities engage in to deny and erase the existence of the Rohingya from the nation’s history is most virulently expressed in the Islamophobic platform of the military-allied extremist Buddhist nationalist organization, Ma Ba Tha. Indeed, it was the Ma Ba Tha that originally campaigned for the arrest of the Rohingya Calendar Six. Commenting on the Rohingya calendar, leading Ma Ba Tha monk Parmaukkha said, “Regarding the calendar, we cannot accept it at all because we do not have Rohingya in our Myanmar history.” Since the arrest of the makers of the Rohingya calendar, the Ma Ba Tha has sent a representative to every trial hearing. 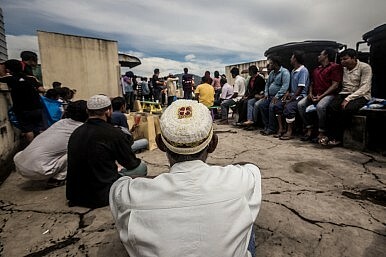 This is a familiar scenario: (i) the Ma Ba Tha manufactures campaigns against an individual or issue that is related to Muslims or Rohingya, and (ii) governmental authorities then get involved on the side of the Ma Ba Tha, claiming they are responding to popular opinion and enforcing the rule of law. The corrosive effects of the war are plain to see from Guantanamo to Yangon. It is destroying the fabric of nations and many lives along the way. In Myanmar, instead of exerting pressure on the actual hatemongers, the military government encourages persecution of those working for a pluralistic and democratic future. The Rohingya Calendar Six, the jailed interfaith activists, and the 12 Muslims sentenced for joining a non-existent terrorist organization are all casualties of the wedding of Burmese state sponsored Islamophobia and the U.S.-led “War on terror.” As they languish in Burmese prisons, Americans would do well to remember our nation’s complicity in their plight. Tauseef Akbar holds a BA in English with a concentration in Creative Writing and an MA in Islamic Studies. He is a researcher and web content manager at the Burma Task Force USA. Did Aung San Lead at Panglong – or Follow? Myanmar's ethnic minorities have a different view on Aung San's place in history. The US Should Cut Its Losses in PakistanMyanmar's Election: The 'Real Burmese' DilemmaInterview: The Stateless RohingyaOn Looming US-China Trade Deal, Actions Speak Louder Than WordsTrue GRIT with North Korea?